Light plugs along at 186,282 miles a second; in comparison to steam locomotives whose speed in the 1860’s was an average was about 15 to 20 mph depending on grade and load pulled, even though as early as 1848, the Boston and Maine RR set the land speed record of 60mph. By 1860, railroad mileage had increased by ten fold in the US and the railroad became the predominant form of motorized land transportation for both passengers and freight. In 1900, at the start of the 20th century, motorized land transportation of people was almost entirely by railroad. The U.S. then had an extensive steam railroad network of almost 200,000 miles with about 14,000 miles of electric railways, consisting of both streetcar and light-rail lines. Where there were no railways, travel was usually by animal or human power (walking and bicycles). Railroad mileage continued to rapidly expand, reaching a maximum of 250,000 miles in the 1920s. In addition there were over 30,000 miles of urban electric railroads. Improvements in steam engine boiler design allowed the Pennsylvania Railroad to attain speeds of over 120 mph by 1905. Here in the early 21st century, Washington defines “high-speed” as just 90 miles per hour, positively slow compared to France’s TGV, which runs from Paris to Avignon at 158 miles per hour. Our current “high speed rail contender” is Amtrak’s ten-year-old Acela train, which briefly hits 150 miles per hour in Massachusetts and Rhode Island, but averages only about 85 over the full route due to limitations of the tracks and overhead electric lines. Thus, it may come as a shock to some, that railroads in the early 20th century routinely operated steam passenger trains at speeds above 80 mph. An early timetable from the Long Island Rail Road shows the lines’ premiere steam train, the “Cannonball” operating to Montauk at a higher speed then than it does now. As the 19th century moved on, railroads strove to find and implement new technology that would allow for ever increasing speeds. This meant improvements in steam engine design and in communications between moving trains and stationary dispatchers. Much of the improvement in the speed and reliability of steam train service in the US depended on the adoption of coal, specifically soft coal, for providing a more efficient power supply to turn water into steam. While the inherent efficiency of pulling heavy loads while riding on wheels and rails is not in dispute, the steam engines that powered steam railroads in 1900 were very inefficient. Operating a steam engine under pressure is, by its very nature, energy inefficient. Only a few percent of the heat energy of the fuel actually provides the power to do work. Passenger trains were also quite heavy. Electricity for the electric railways was very inefficiently generated. It then took about 8 times as much fuel to generate a kilowatt-hour of electricity as it does today. Prior to the easy availability of coal, rail and ship transport in North America was powered largely by chopped wood. Indeed, up until 1870 most railway locomotives in the United States ran on wood. The inefficiency of using wood to run steam engines is staggering. The BTU’s (heat output) of wood fuel is only around 3,200 BTU per pound, assuming a 50% moisture content. Typical bituminous coal is in the 10,000-14,000 BTU per pound range, a vast improvement over wood. It is extremely unlikely that it would be possible to run wood powered steam locomotives today. In fact, we can probably attribute the continued growth of rail in the 19th century after the 1860s to developments in coal extraction – by 1880 track miles had increased to 90 thousand miles, while consumption of wood was cut to a third of the 1860s numbers. Records show that the use of coal to fire steam engine boilers started as early as the 1840s, it varied by railroad and by territory. Wood consumption by U.S. railroads in 1870 was some 3.6 million cords per year. Using the average “one cord per acre per year” rule, sustainable production of that amount of fuel would require more than 14 thousand square kilometers of forest. Using wood for steam engine fuel was incredibly damaging to the environment, even in 1870, when America had only 30,000 miles of rail. One could only surmise how much forest the railroads would require to sustain steam engines today when total track miles exceed 230,000 miles. Railroads without ready access to on-line coal mines stuck with wood fuel quite late. When the transcontinental railroad was completed in Promontory Utah in 1869, the CP Jupiter was wood-fueled while the UP 119 was coal-fueled. A factor that limits steam locomotive performance is the rate at which fuel is fed into the fire. In the early 20th century some locomotives became so large, that the fireman could not shovel coal fast enough. In the United States, various steam-powered mechanical stokers became standard equipment. Introducing cold water into a boiler reduces power, and from the 1920s a variety of heaters was incorporated. Steam locomotives consume vast quantities of water because they operate on an open cycle, expelling their steam immediately after a single use rather than recycling it in a closed loop as stationary and marine steam engines do. Water was a constant logistical problem, and in some desert areas condensing engines were devised. These engines had huge radiators in their tenders and instead of exhausting steam out of the funnel it was captured and passed back to the tender and condensed. Steam Engines reached their peak efficiency by 1940, and even before that, other methods of improving rail operations were being embraced by the industry. Railroad communications specialists are tasked with implementing data, interoperability and control technologies to improve safety and service. Radio communications for transportation, particularly railroads, is heavily regulated. Railroads face the same technology issues and spectrum-efficiency problems as the rest of wireless users, but their problems are more complex. Although railroads are ostensibly private companies, their activities in providing public transportation for goods and passengers make them subject to closer federal scrutiny. Much of the radio infrastructure for a railway system is made up of dispatch centers and maintenance vehicles similar to those found in public safety or public works applications. But the locomotive is a different animal. The working environment for train-mounted railroad radios is filled with ambient noise up to 90dB. The radio has to fit in a moving workstation filled with other more critical, mission-specific equipment. In the early part of the 20th century, the use of radio presented many questions to people wishing to use it. For example, there was some controversy surrounding the question as to whether radio signals could be transmitted to fast moving objects such as trains. Guillermo Marconi wished to expand the use of the radio to include vehicles that moved on land as well as water and test the possibility of transmitting telegraphic signals to moving trains. In the early 20th century, the “wireless telegraph” (radio) for use at sea and for long-distance transmission has been well developed. But before it could be applied to the railroad a good many problems had to be solved. In November of 1913, the Delaware, Lackawanna and Western Railroad began a series of experiments in the hope of developing a more reliable method of directing the movements of trains than was available at the time. Earlier that year, the company had erected several transmitting towers, one at Scranton, PA., and another at Binghamton, NY, for the transmission of radio signals. Radio telegraph equipment was placed within the railroad stations and comprised of a transmitter made by the Marconi Company. The experiment was begun merely with the idea of ascertaining if Marconi’s great invention, the radio, would be a more reliable way of remaining in touch with the operators of their trains. Oddly enough, an attempt to communicate with a moving train crew came as an afterthought. In 1913, the major cause of train accidents was employee error. The situation was so bad – an amazing 75% of train accidents occurred because of negligence- before the adoption of radio in the control cabs of engines, that trains were required to make automatic train stops in order to reestablish contact between dispatcher and train crew. Some sort of method that enabled train dispatchers to remain in contact with moving equipment was sorely needed. 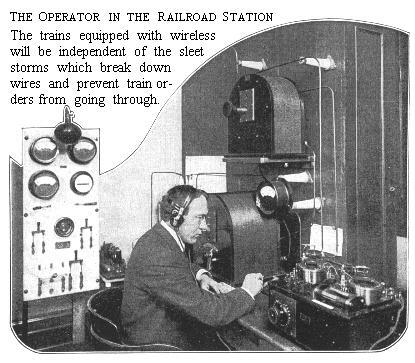 The radio became one way to accomplish the stops for orders, which could be done if the wireless telegraph could be made to work between the dispatcher’s office and the train. The telegraph system, while extremely useful to railroads, had an inherent limitation; that being its subjection to foul weather. Sleet and ice storms often caused the wires to break, thus causing a loss of communication until found and repaired. Railroad companies of the day were still smarting from the recent day that President Taft was inaugurated when every wire leading into Washington was broken down by a sleet storm. Train dispatch was halted for many hours while the telegraph wires were repaired. Wireless would offer an obvious improvement to train dispatching. On November 4th, the first train order ever sent by wireless telegraph was sent from the dispatcher’s office at Scranton, Pennsylvania to the Binghamton, New York block operator’s office where it was duly delivered to one of the train crews in the regular way. 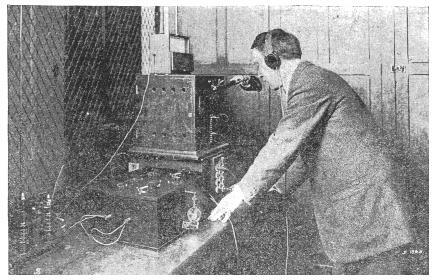 On November 27th 1913, the first “official” wireless transmission was transmitted from Scranton, PA towards the train traveling to Binghamton, NY at 60 miles per hour. In all, 350 words representing several pieces of news were clearly picked up by the operator aboard the train. On that first day, the train was in continuous communication with one of the two stations from a point thirty miles east of Scranton to a point thirty miles west of Binghamton. The first test involving a moving train was a rousing success. Further testing revealed that the forces of nature were much less likely to interfere with station to station, and station to train communications than with the telegraph. This “wireless telegraph” would prove equally serviceable in sending news bulletins for the edification of passengers and also enable them to send messages without waiting for the train to stop at a telegraph station. I am a retired Rail Road Conductor with 31 years on the job, with an interest in Radio production and Politics. I have been married for 34 years, and I have three grown children.